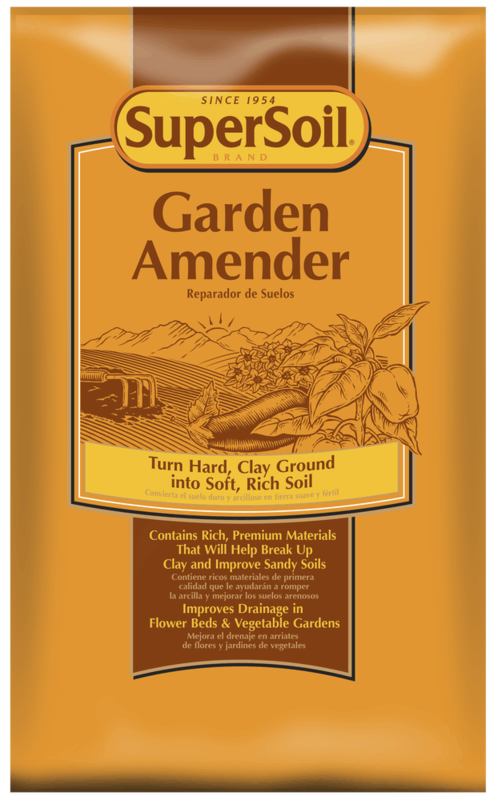 Supersoil Garden Amender contains rich, organic materials and composted manure that will help to break up clay and improve sandy soils. The result is an ideal growing environment for flowers and vegetables. Plus, it contains plant foods for up to 45 days of feeding. Contains rich, organic materials and composted manure for up to 45 days of feeding. Improves drainage in flower beds and vegetable gardens by turning hard, clay ground into soft, rich soil. For planting individual plants. Dig a hole twice as wide as the container/rootball. Mix Garden Amender with 1 part native soil. For amending beds, apply a 3-inch layer and work into the top 6 inches of the soil. Plant seeds or live plants following specific package or plant tag instructions. Water throughly after planting then daily. Cover area with mulch. Apply when preparing soil in outdoor gardens and landscape beds.